Check out this pair of Warren Platner for Knoll side chairs. The Platner chairs were introduced in 1966 which makes these first year models as they retain their Knoll Associates label. Knoll changed its name to Knoll international in 1967. This pair features the coveted (and upgraded) bronze finish, vertical steel wire rods welded to circular horizontal and edge-framing rods. The frame base has a clear plastic extrusion ring for a smooth bottom surface that protects your floors (and the chairs). The seat is a molded fiberglass shell. 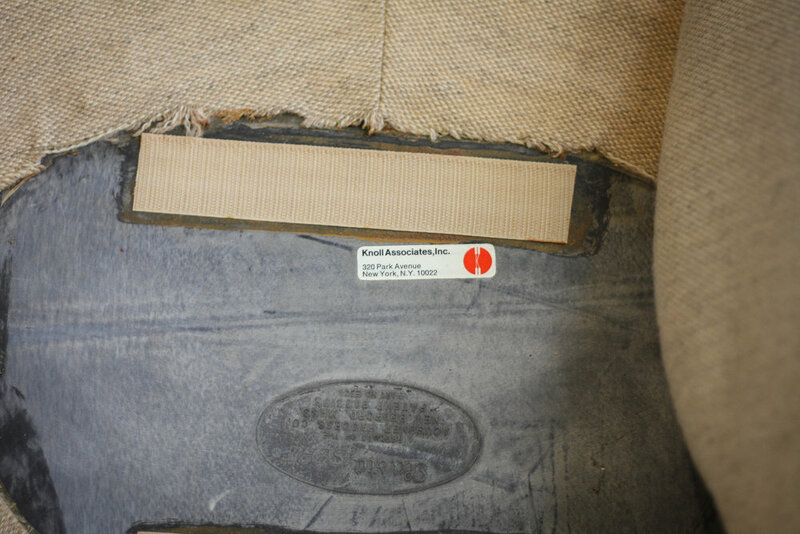 It features the original Knoll wool/tweed upholstery in perfect condition with Knoll logos on the bottom side of seat. Fabric is mint condition, however if you felt so inclined the foam could be replaced as it has become dehydrated in the back rest area of the chairs. All welds are solid and there are no rips, tears or stains on the upholstery.